The fourlined plant bug, Poecilocapsus lineatus (Fabricius), is a common garden pest found throughout much of the United States and Canada east of the Rocky Mountains. It causes distinctive feeding damage on an enormous range of plants, but most often damages ornamentals in the mint (Lamiaceae) and composite (Asteraceae) families. Nymph and adult stages are active for a relatively short period during late spring and early summer. These insects overwinter as eggs deposited in tender stems of early-season plant growth. For unknown reasons it appears that populations naturally fluctuate, causing periodic outbreaks for one or several seasons. Figure 1. Adult fourlined plant bug, Poecilocapsus lineatus (Fabricius), detailing the head structure and mouthparts. Photograph by Mark Cassino, Mark Cassino Photography. Lygaeus lineatus Fabricius, 1798. Original name/combination. Phytocoris lineatus (Fabricius, 1798); Fitch, 1870. Lygus lineatus (Fabricius, 1798); Glover, 1875. Poecilocapsus lineatus (Fabricius, 1798); Reuter, 1875. Poecilacapsus [sic] vittatus (Rathvon, 1869); Uhler, 1884. Poscilocapsus [sic] lineatus (Fabricius, 1798); LaFollette, 1915. Poecilocapsus lineatus (Fabricius, 1798). Valid name. 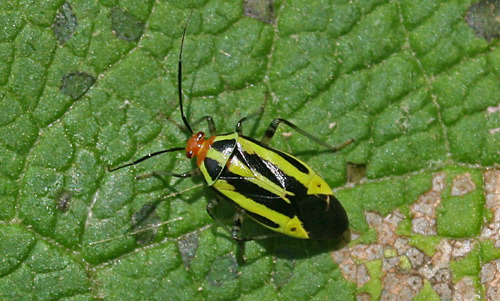 The common name four-lined plant bug and a misspelling of the scientific name as Poecilocapus lineatus are also regularly used in reference to this insect. The fourlined plant bug is a native species and is common throughout most of the eastern and midwestern United States and Canada. Although less common, fourlined plant bug has been documented in much of the southern United States, including records from the Florida State Collection of Arthropods (FSCA) as far south as Lee and St. Lucie counties. Distribution in the northwestern states and west of the Rocky Mountains is not known. Slingerland (1893) gave the first thorough description of Poecilocapsus lineatus (Fabricius. ), which was reviewed by Wheeler and Miller in 1981. This insect’s phenology (life stage development over the seasons) is highly dependent upon latitude and local climate, although activity generally increases in the spring. For example, in Ithaca, New York, eggs hatch in mid- to late May and adults appear in mid- to late June. Further south in Harrisburg, Pennsylvania, eggs begin to hatch in mid- to late April, with the first adults appearing in late May (Wheeler and Miller, 1981). Eggs: Eggs are 1.65 mm long and cylindrical but slightly curved, with the upper third forming a striated cap. They are initially light yellow and turn a reddish color in the spring as they mature. Females may oviposit at several sites using their blade-like ovipositor to make a slit lengthwise into a tender plant stem, cutting through the outer layers and into the pith tissue. The eggs are tightly packed into the slit, leaving their tips slightly visible. Each slit contains one row of eggs, averaging six to eight eggs each. Nymphs: There are five nymphal instars. 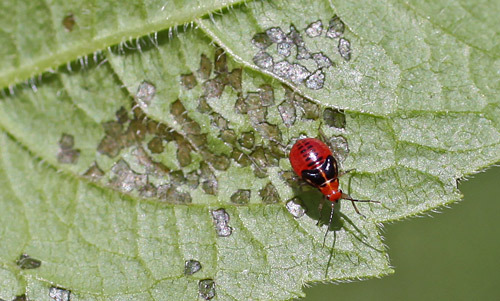 First instars emerge in late spring and quickly cause visible damage, although their small size and tendency to hide makes them inconspicuous. They develop rapidly, with wing pads becoming more evident at each instar. The nymphs are bright red until the last instar, which is bright orange. In total, the development of the nymphs takes about 17 to 20 days. Table 1. Duration of time between molts and approximate length of each instar of the fourlined plant bug, Poecilocapsus lineatus (Fabricius). Figure 2. Early instar nymph of fourlined plant bug, Poecilocapsus lineatus (Fabricius), with feeding damage. Photograph by Joe Boggs, Ohio State University Extension. Figure 3. Late instar nymph of fourlined plant bug, Poecilocapsus lineatus (Fabricius), with feeding damage. Photograph by Joe Boggs, Ohio State University Extension. 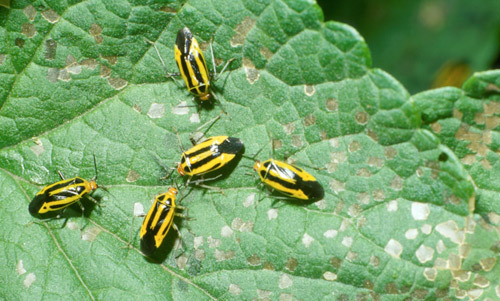 Adults: Fourlined plant bug adults are identified by four distinct black lines against a yellow-to-green background color. They are 7-7.5 mm long, and 3.5 mm wide. The head is orange, with prominent dark reddish-brown eyes. Male and female adults look very similar, although the female is slightly larger and broader, especially in the abdomen. About a week after adults emerge, the insects mate and females begin ovipositing clusters of eggs. Females live significantly longer than males, so late-season populations primarily consist of females. In general, adults are present for approximately one month. Figure 4. Adult fourlined plant bug, Poecilocapsus lineatus (Fabricius), with associated damage. Photograph by Joe Boggs, Ohio State University Extension. Figure 5. Fourlined plant bug, Poecilocapsus lineatus (Fabricius), adults feeding, with associated damage. Photograph by Jeff Hahn, University of Minnesota Extension. Fourlined plant bugs overwinter as eggs. Nymphs emerge in late spring and begin feeding on tender new shoots. Over the next 17-20 days they rapidly develop through five instars, actively feeding and causing the majority of plant damage. Soon after the final molt, adults mate and females begin laying egg clusters in the upper stems of the current season’s growth. Adults are active for about one month before gradually dying off by early to mid-summer. Eggs will hatch in the following spring. Contrary to some of the earliest reports, only one generation per year has been documented. Fourlined plant bug feeds on approximately 250 plant species in 57 families, although it is not well known which are favored for reproduction. Damage is most often a concern in home gardens where the insects regularly attack herbs and ornamental plants, especially those in the mint and composite families (Lamiaceae and Asteraceae). Commonly preferred hosts include hyssop (Hyssopus officinalis), lavender (Lavandula spp. ), marjoram (Origanum spp. ), peppermint and spearmint (Mentha spp. ), sage (Salvia officinalis), ageratum (Ageratum spp. ), coreopsis (Coreopsis spp. ), dahlia (Dahlia spp. ), florist’s chrysanthemum (Chrysanthemum × morifolium), feverfew and tansy (Tanacetum spp. ), Shasta daisy (Leucanthemum × superbum), gaillardia (Gaillardia spp. ), globethistle (Echinops ritro), and wormwood (Artemisia spp.). Vegetables that may be attacked are often members of Apiaceae, Asteraceae, Brassicaceae, Cucurbitaceae, Fabaceae, and Solanaceae families. Common crops that may be damaged include potato, cucumber, lettuce, peas, radishes, squash, with most severe damage on parsnips. In commercial production, fourlined plant bug can be an economic pest of perennial herbs in the mint family (Lamiaceae), such as lavender, sage, oregano, mint, lemon balm, thyme, marjoram, savory, and catnip. Historically, fourlined plant bug was a major pest of currant and gooseberry (Ribes spp. ); however, these crops are no longer grown on a commercial scale. Fourlined plant bug injury is rare on ornamental shrubs, although it can occasionally damage azalea (Rhododendron spp. ), deutzia (Deutzia spp.) dogwood (Cornus spp. ), forsythia (Forsythia spp. ), viburnum (Viburnum spp. ), and weigela (Weigela spp.). Outside of home gardens and ornamental plantings, common native and naturalized plants that support fourlined plant bug populations include bittersweet (Solanum dulcamara), bouncing-bet (Saponaria officinalis), burdock (Arctium minus), Canada thistle (Cirsium arvense), catnip (Nepeta cataria), chicory (Cichorium intybus), common mugwort (Artemisia vulgaris), common mullein (Verbascum thapsus), dandelion (Taraxacum officinale), dame’s rocket (Hesperis matronalis), dock (Rumex spp. ), evening primrose (Oenothera biennis), ground ivy (Glechoma hederacea), Japanese honeysuckle (Lonicera japonica), and teasel (Dipsacus fullonum). To view the complete list of known hosts described by Wheeler and Miller (1981) see the original report here, with the host list beginning on page 26. Damage caused by fourlined plant bug is distinct. Each feeding site appears as a semi-transparent dark spot of collapsed leaf tissue. 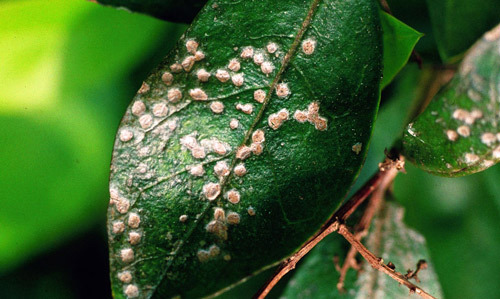 Characteristics of the host leaf (e.g., shape, texture, pubescence, venation) determine how the spots develop. They may be angular or circular; green, rusty yellow, or reddened; and 2 mm or less in diameter. 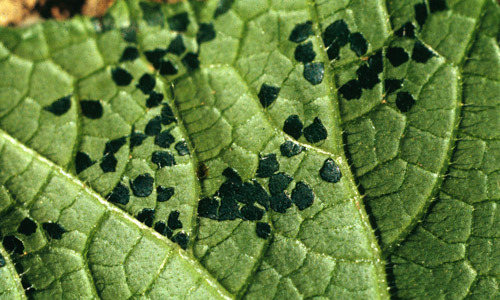 On some leaves, the dead tissue may drop out several weeks later, resembling tiny holes caused by flea beetle feeding. Under heavy attack, entire shoot tips become severely wilted and new growth may curl with distortion or die. Young leaves and terminal shoot tips of herbaceous plants are most often attacked, although damage to ornamental shrubs (and rarely shade trees) may occur on lower branches and vigorous tender growth, such as suckers and water sprouts. Although fourlined plant bug damage is relatively distinct from other types of insect damage, the sudden onset of spots and withered shoots can easily be mistaken for disease symptoms, such as water-soaked leaf spots and shoot blight. Care should be taken to confirm the source of damage, although this is difficult due to the insects’ speed and tendency to hide. Unlike the similar dark, sunken lesions inflicted by various bacterial and fungal plant pathogens, feeding sites are more uniform in shape and size and lack a chlorotic margin. Figure 7. Comparison of feeding spots from fourlined plant bug, Poecilocapsus lineatus (Fabricius) (upper leaf) and Septoria leaf spot disease (lower leaf) on lavender. Photograph by Sean Westerveld, Ontario Ministry of Agriculture, Food and Rural Affairs. Fourlined plant bug feeding damage develops quickly. Other insects in the same family (Hemiptera: Miridae) are known for causing rapid damage, ranging from 10-15 seconds to several hours. However, only Poecilocapsus lineatus and one other species, Mircarvalhoia arecae, are known to cause immediate damage with “lesions seeming to appear simultaneously with insertion of the bug’s stylets” (Wheeler & Miller, 1981). Cohen and Wheeler (1998) determined that the extremely rapid damage to plant cells was due to the insect’s enormous salivary glands, which enable it to inject copious amounts of enzyme-rich saliva into the plant tissue. They hypothesized that this rapid feeding rate over the short period of early-season activity is necessary for the insect to meet its nutrient requirements for growth and reproduction. Figure 8. Old feeding injuries from fourlined plant bug, Poecilocapsus lineatus (Fabricius). Photograph by Whitney Cranshaw, Colorado State University, Bugwood.org. Mechanical control: Early detection is critical for many control measures, so monitoring for nymphs and damage should begin in mid- to late spring. Hand removal of nymphs and adults can be effective for controlling small populations but is made challenging by the insects’ speed, their tendency to drop off foliage when disturbed, and the adults taking flight. For this reason, cupping your hands underneath or around the leaves is advised. Syringing (using a hard stream of water to dislodge insects) can knock nymphs off plants and make reestablishment difficult. Traditionally, it was recommended in midsummer to inspect plants that had suffered damage and selectively prune out and destroy shoot tips where eggs had been laid. Because females tend to lay their eggs in the upper 4-5 inches of growth, it is possible to destroy much of the next generation. However, the egg masses and slits in stems can be extremely difficult to locate, so this seems practical only on a small scale. Floating row covers (fine netting placed over the row) have been used on some crops to exclude active fourlined plant bugs. However, covers are best suited for early season annual crops and may be inappropriate for most fourlined plant bug hosts. For example, row covers may trap egg masses from the previous season on perennial plants. Cultural control: Commercial production trap crops have been recommended to lure the insects away from a target crop, but this is impractical for many of the preferred mint family (Lamiaceae) crops. For many perennials, a better option is to practice good field sanitation, thoroughly cutting back growth at the season’s end and destroying stem debris that may contain egg masses. Avoiding the insects' period of activity may be possible by growing susceptible cool-season crops during the autumn. Biological control: Natural enemies of fourlined plant bug are not well studied. A predatory wasp larva, Cirrospilus ovisugosus (Hymenoptera: Eulophidae) tunnels through stem pith and feeds on rows of fourlined plant bug eggs, often attacking in pairs and destroying the entire egg cluster. There is also a jumping spider, Phidippus clarus (Arachnida: Salticidae), that has shown promise as a biocontrol control agent of fourlined plant bug. Chemical control: Chemical control is rarely recommended. Typically, damage is cosmetic and not economically important because the insect is active for a relatively short period in late spring and early summer, allowing host plants ample time to recover from damage. However, fourlined plant bug populations do fluctuate, which can make damage more severe during outbreak years. Contact pesticides such as horticultural oils and insecticidal soaps may suppress populations if applied to nymphs. However, control is difficult because the insects are very mobile and able to escape applications. In rare cases of severe damage to ornamentals, several biorational and conventional insecticides commonly used against similar pests may be effective. For current control recommendations, consult your local Cooperative Extension Service office and utilize up-to-date UF/IFAS EDIS publications. Figure 10. Heavy feeding damage on leaves caused by adult fourlined plant bugs, Poecilocapsus lineatus (Fabricius). Photograph by Jeff Hahn, University of Minnesota Extension. Cohen AC, Wheeler Jr. AG. 1998. 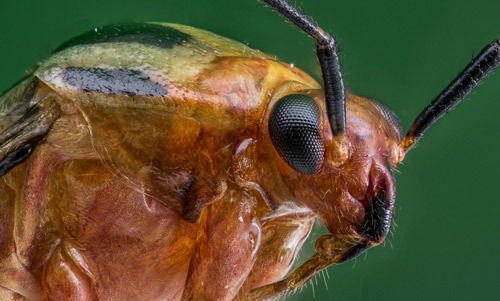 Role of saliva in the highly destructive fourlined plant bug (Hemiptera: Miridae: Mirinae). Annals of the Entomological Society of America 91: 94-100. Filotas M, Westerveld S. 2011. 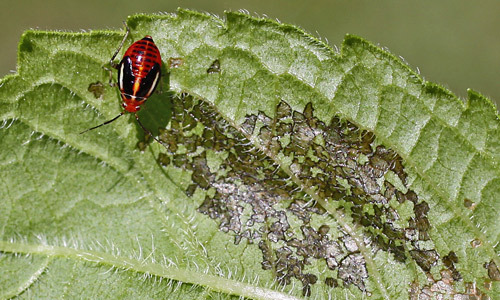 Four lined plant bugs — on mint plants near you! Ontario Ministry of Agriculture, Food and Rural Affairs. Henry TJ, Froeschner RC, eds. 1988. Catalog of the Heteroptera, or True Bugs, of Canada and the Continental United States. Leiden, NY, USA. E. J. Brill. Hoefler CD, Chen A, Jakob EM. 2006. The potential of a jumping spider, Phidippus clarus, as a biocontrol agent. Journal of Economic Entomology. 99: 432-436. Kelton LA. 1980. The plant bugs of the prairie provinces of Canada. Heteroptera: Miridae. The Insects and Arachnids of Canada. Part 8. Canadian Government Publishing Centre. Hull, Quebec. 408 pp. Klass C. 1985, updated 2012. Fourlined plant bug. Insect Diagnostic Laboratory, Department of Entomology. Cornell University, Ithaca, NY. Klingeman WE, White SA, LeBude AV, Gauthier NW, Hale F, Fulcher A. Revised 2015. IPM for shrubs in southeastern US nursery production, Volume 1, Chapter 5 — Viburnum spp. Southern Nursery IPM Working Group, Clemson, SC. Knight HH. 1941. The plant bugs, or Miridae of Illinois. Bulletin of the Illinois Natural History Survey. 22: 172. Shetlar DJ. Revised 2003. Plant bugs on perennials and landscape Shrubs (fourlined, tarnished and phlox plant bugs). Bug Doc Fact Sheets, The Ohio State University. Slingerland MV. 1893. The four-lined leaf-bug. Cornell University Agricultural Experiment Station Bulletin. 58: 207-209. Wheeler AG, Miller GL. 1981. Fourlined plant bug (Hemiptera: Miridae), a reappraisal: life history, host plants, and plant response to feeding. The Great Lake Entomologist 14: 23-35. Wheeler AG. 2001. Biology of the plant bugs (Hemiptera: Miridae) Pests, predators, opportunists. Cornell University Press. Ithaca and London. 507 pp. Authors: Matthew Borden and Adam Dale, Entomology and Nematology Department, University of Florida. Photographs:Jeffrey Hahn, University of Minnesota Extension, Joe Boggs, Ohio State University Extension, Mark Cassino, Mark Cassino Photography, Whitney Cranshaw, Colorado State University, Sean Westerveld, Ontario Ministry of Agriculture, Food and Rural Affairs, © Queen’s Printer for Ontario, 2016. Reproduced with permission. Acknowledgement: We thank Dr. J. Howard Frank for his assistance with the taxonomic format.